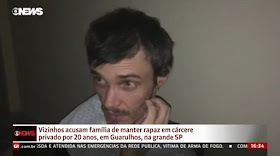 A 36-year-old Brazilian man was freed yesterday after allegedly being held captive by his father and step-mother in the basement of their home for at least 20 years. Police in Brazil came across Armando de Andrade by accident after they searched homes looking for members of a drugs gang. 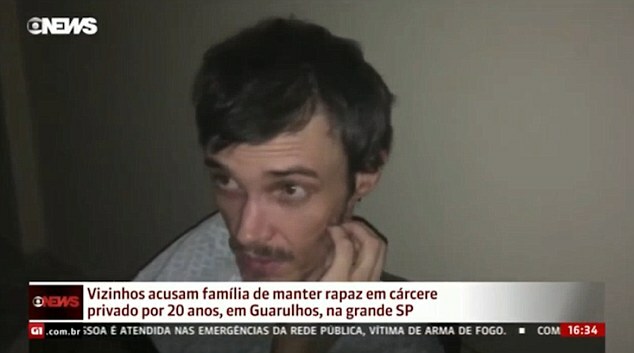 The man, who disappeared when he was 16, was reportedly tied to a bed in a tiny, windowless room of the house in Sao Paulo. He was found with 'enormous' toenails and fingernails and a long beard which had grown to his knees, according to witnesses, while police officers who found him described him as 'malnourished'. 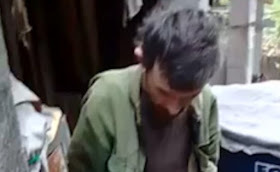 Police believe he lived in virtual darkness for two decades in a room without light fittings, while the floor was reportedly covered in human faeces. Police chief Celso Marchiori, who is investigating the case, said of the moment policemen found him: 'He got up, very impaired and didn't speak a word. We took him outside and he still didn't say anything. We didn't know if he was scared or drugged. 'He wasn't able to identify us as police officers. We called for help and he was taken straight to hospital.